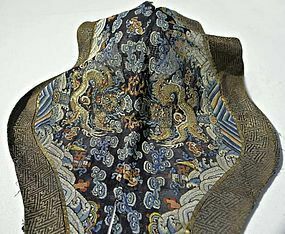 A decorative fragment taken from the cuffs (horse-hoof shape) of a summer silk dragon robe with five clawed front facing dragons (couched pure silver wrapped threads) on a fish net like gauze weave. Each dragons appears to be wearing headdress. The cuffs from each sleeve are sewn together in the center and the borders are silver brocades. Circa, first half of 19th century. Approx. 19" x 15 1/4"